The Afghan government has announced new jobs for three provincial militia leaders, widely known as warlords. The move is aimed at reducing their power ahead of October presidential elections, but many are sceptical. Under the deal, militia leaders in Nangarhar and Kandahar provinces become police chiefs. 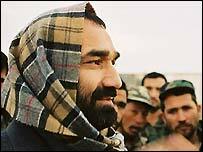 Powerful commander Atta Mohammad becomes Balkh governor. Regional militia chiefs are widely seen as the main obstacle to progress in Afghanistan and a successful vote. Some government officials were billing this beforehand as an important move against regional militia commanders. However, many people are already saying this was more a case of punishment by promotion than a serious effort to reduce their influence. Some argue that as governor in Balkh province, Atta Mohammad, may in fact increase his power. The same may apply to Hazrat Ali in Nangarhar, a close ally of US forces in 2001 in their unsuccessful hunt for Osama Bin Laden. But President Hamid Karzai's spokesman said the government is trying to provide what he called opportunities to help ensure free and fair elections. As always, Afghan politics is a delicate balancing act. Few doubt Mr Karzai wants to reduce the power of militia commanders. His problem, say many political analysts, is that he still needs perhaps the most important one on side - namely Defence Minister Qasim Fahim, who is also a patron of two of the men involved in this move. Many Afghans, though, will see this as more evidence that for now the commanders, or warlords as they are commonly known, are untouchable.